6 RECORDS // 6 UNKNOWN ARTISTS // 6 UNTITLED TRACKS no actually it’s only one record and five tracks. Unknown artist might not be that much into numerology, but it is still incredible to celebrate 6 years of this project. We really want to thank everyone that has supported us, visited our parties, and played our records… Unknown artist starts this fourth instalment with a murky ambient track on A1 before delving into trippy xylophonic techno on A2 and finally going full out mental on A3. 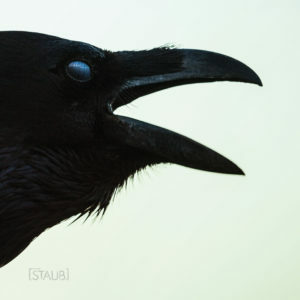 B1 starts with a more restrained cut – but that’s just a ruse, you are in the eye of the storm – because B2 with its frantic pace picks it up for a fitting brutal final of a well rounded, versatile techno record. A bit like a STAUB. Berlin techno collective STAUB is about to celebrate six years of existence. STAUB runs monthly daytime events at Berlin’s ://about blank club. Line-up stays secret, and main focus is on the music. During these years, STAUB travelled to Detroit, Bogota, Copenhagen, Hamburg, Milan and more. Fourth release of STAUB will be out on Irakli’s new label Intergalactic Research Institute for Sound, and will be available at the event STAUB 6 Years Anniversary on February 22-23.